This is a picture of Sylvia Rhea Bryan when she was 17 years old. Taken around 1910. 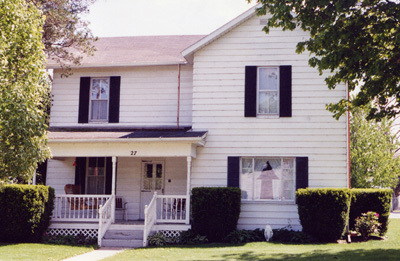 Charles S. Richmond and his wife, Sylvia Rhea Bryan lived at 27 High St., Hayesville, Ohio. They lived there from about 1945 to 1947. At that time there were no addresses and mail was picked up at the post office. Sylvia Rhea Bryan is buried in Synagogue Cemetery. It is located south of Hayesville, Ohio on County Rd. 2075, off US State Route 60. Rhea Richmond, 88, formerly of Hayesville, died Wednesday evening at the Good Shepherd Nursing Home. 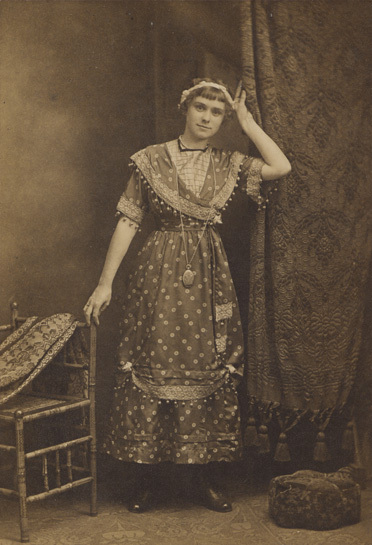 The daughter of Willis and Alice Coble Bryan, she was born in Ashland County, Oct. 26, 1893. She was a member of Calvary Baptist Church of Ashland. She is survived by three daughters, JoAnn Bartley of Scottsville, Ky., Marian Burr of New York City and Lillian Hout of Ashland; eight great-grandchildren and one sister, Orpha Detweiler of Tallmadge. Services will be held at 2 p.m. Saturday at Fickes Funeral Home, Jeromesville, with the Rev. Homer E. Graven officiating. Burial will be in Synagogue Cemetery. Friends may call one hour prior to the services at the funeral home. 1. Cemetery: Synagogue Cemetery: Ohio. The picture is the grave of Sylvia Rhea Bryan. It is located in Synagogue Cemetery south of Hayesville, Ohio. 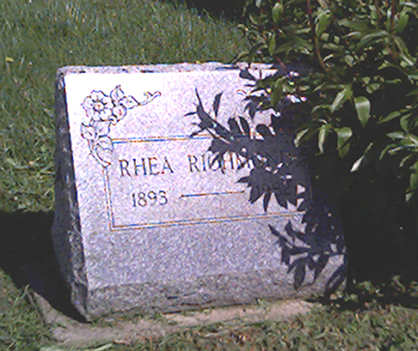 Her married name, Richmond, is on the stone. 2. Residence. Charles S. Richmond and his wife, Sylvia Rhea Bryan lived at 27 High St., Hayesville, Ohio. They lived there from about 1945 to 1947. At that time there were no addresses and mail was picked up at the post office.